Right now, thousands of Bajans are getting ready to celebrate Halloween. To tell the truth, I can’t understand this sudden fervour for a festival (if you could call it that) that has nothing to do with us. It’s yet another American import – they have made this a holiday since back in the 19th century, but in other parts of the world, it’s part of mourning and celebrating those who have passed – no silly costumes in sight. I certainly won’t be dressing up, but if we have to focus on ghost stories and general spookiness, let’s at least make it culturally relevant. Any ‘granmuddah chile’ could tell you, that we in Barbados are chock-full of scary stories…Steel Donkey, Heart Man, Baku Man…. The list is seemingly endless. Today however, probably due to our peculiar bias, we are going to talk about the Chase Family Vault. The vault is in the graveyard of Christ Church Parish Church. Back in 1724, James Elliot had a vault built, partly underground. In 1807 on 31st July, Thomasina Goddard was buried there. Seven months later, on 22 Feburary 1808, the Chase family, an important but highly disliked family at the time, acquired the vault and little Mary Ann Maria Chase, Thomas Chase’s infant daughter, was interred there. In 1812, his other daughter, Dorcas Chase joined her. Both girls’ caskets were made of heavy lead, so it was a big surprise when the vault was opened later that year (this time to bury Thomas Chase) and the caskets had moved. In fact, Mary Chase’s casket was standing on one end, with the head pointing down. The caskets were put back into position. In 1816, when the vault was opened again for the burial of infant Samuel Brewster Aimes, the Chase family’s coffins were found in a state of disorder. Again, they were moved back into position, and the vault sealed in cement. This time, to make sure that this was not the work of pranksters, the floor of the vault was sprinkled with sand, in the hope of capturing any human footprints.. Later that year, when the vault was opened for the interment of Samuel Brewster, the same thing happened. And it happened again in 1819 with the burial of Thomasina Clark. Each time the vault was resealed. 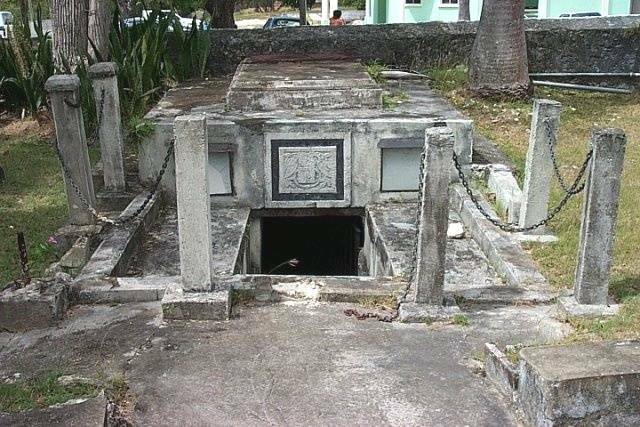 At this point the governor of Barbados, Lord Combermere, got involved, examining the vault thoroughly. After establishing that there was no secret way into the vault, the coffins were put back in order and the vault was sealed with the official seals of the Governor and his staff. Eight months later, in April 1820, the vault was reopened. Although the seals were intact, the coffins had again been moved. At this point, it was decided to abandon the vault. At the request of the family, all the coffins were removed and buried in graves and the vault still lies empty in Christ Church Parish Church today. Although there have been many theories about the cause of the displaced coffins, the mystery still remains. Spooky, isn’t it?